For the next couple of weeks I am on a cruise around the Caribbean. This is a joint celebration with both my 40th birthday and Christmas falling within that time. 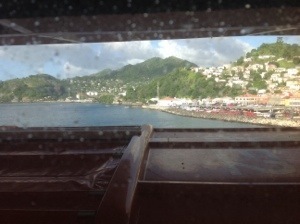 So far I have been to Barbados, Grenada, St Lucia and Dominica on the journey with more destinations to come. I keep having to remind myself that I am not on the Woodchurch heading the long way round to Birkenhead. Nor am I on the Prince of Brittany chuffing across to Le Havre. I’m most certainly not on the Lady of Mann or the Mannananananananannanananan. I am on the luxury P&O liner Azura. You can tell it is luxury. Internet usage is charged per minute with 200 minutes costing a horrific £65. A can of lemonade the size of one you might put in a dolls house is 90p. Sure signs. But the biggest give away that you are on a luxury cruise is the amount of moaning and complaining from the passengers. Just what you want to hear every dinner time. First world problems. They’re not even things worth complaining or moaning about. Mostly I would have just shrugged and gone “Ah well, its not their fault, it happens” but it seems everyone else on the ship apart from Zoe and me are intent on nitpicking every slight slip up. To me, this cruise has been bang on. OK if you’d said I was going on a holiday on a floating Butlins Holiday Camp complete with red coats, Sunday Night at the London Paladium level of entertainment and force fed shopping I probably would have thanked you and opted for a weekend in Wales instead. But no, the dodgy entertainment and frightful co-passengers apart, this is, so far, a really enjoyable experience and I’m glad I came.